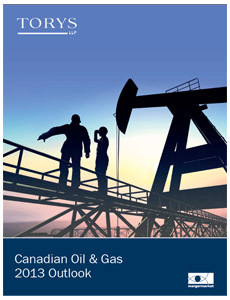 Torys is pleased to present the Canadian Oil & Gas 2013 Outlook, published in association with mergermarket. Based on a series of interviews involving 100 senior corporate executives and investment bankers focused on the Canadian oil and gas market, this report provides a detailed analysis of some of the key challenges and opportunities for the sector. Global threats of increased austerity, dynamic production sources and pervasive anemic global economic growth present operational challenges for a majority of participants. Notwithstanding these challenges, through interviews with senior corporate oil and gas professionals we found that most expect merger and acquisition (M&A) activity in the sector to increase over the next 12 months. Following the precipitous contraction of capital markets in 2008, the flow of investment capital has improved, creating opportunities for oil and gas companies. Conditions continue to be difficult for junior and intermediate companies for which access to capital remains limited and ongoing consolidation among these companies may be expected. The report highlights important global and domestic factors and uncertainties that will affect transactions, such as pipeline approval, access to capital investment, global realignment of oil production, availability of unconventional hydrocarbon sources, and underlying commodity supply and demand fundamentals. Navigating the challenges and balancing the risks is critical in order to be successful in the global oil and gas industry as a whole. Forty-two percent of survey respondents cite economic risk as the most significant challenge Canadian oil and gas companies face when contemplating a foreign transaction, while political risk and legal risk followed with 31% and 25%, respectively. The final quarter of last year provided senior executives and industry observers with a considerable amount of detail to analyze in making short-term capital investment decisions. Specifically, the uncertainty of how future expanding US oil production will impact global demand for sour crude is important for project planning, particularly for Canadian oil sands producers which historically have been largely dependent on US markets. 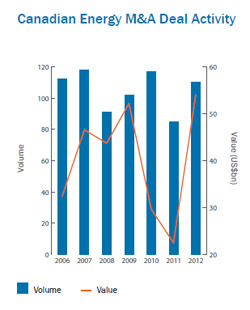 While underscoring significant themes, regulatory issues and industry developments for 2013, an important takeaway of this report is that the majority of respondents expect a stimulative M&A environment to materialize. Foreign interest in Canadian oil and gas exploration and production companies is expected to remain strong; however, future projects are likely to require more creative structures. The Canadian federal government has recently announced a new policy stating that exposure to Canadian oil sands deposits for foreign enterprises will be subject to more restrictive governmental scrutiny; this will likely lead to more joint ventures with domestic partners as opposed to takeovers of Canadian oil companies. This policy development will provide foreign investors with exposure to the desired resources, and disperse project risks across multiple parties. The objective is to facilitate Canadian industry expertise in retaining control of oil sands projects, funded and assisted by foreign capital and talent. Organic growth, improving balance sheets, joint ventures and acquisitions will all be important strategic considerations for public, private, national and institutional organizations involved in the oil and gas industry, regardless of the geographical location or the relative size of market capitalization. This report explores how these strategies are expected to affect activity in the Canadian oil and gas sector over the next 12 months. As is the case with most commodities, oil and gas price forecasts are a vital planning component that underpins the pace and scope of project development and transaction activity in the oil and gas sector. The Energy Information Agency (EIA) forecasts that Brent and WTI crude oil spot prices will average US$104 per barrel and US$88 per barrel, respectively, in 2013. The long-time historical WTI discount to Brent crude oil, which averaged US$23 per barrel in November, is expected to fall to an average of US$11 per barrel by the end of 2013 as planned new pipeline capacity lowers the cost of transporting oil to refining centers in the Gulf Coast. However, Canadian heavy oil is expected to continue to be significantly discounted against the Brent and WTI benchmarks given current processing constraints and lack of market access. Amid a muted global M&A market, the total value of Canadian oil and gas transactions hit a record high in 2012, largely impacted by CNOOC’s US$17.7bn acquisition of Nexen (China’s largest foreign acquisition to date) and the US$5.1bn acquisition of Progress Energy Resources by Malaysia’s Petronas. A combination of domestic and foreign interest, availability of financing and attractive targets suggests the sector will continue to drive Canadian M&A.